This little one runs like a turtle, some routine software patches (java, flash player, pdf reader etc) could easily break it. This category of gadget has been killed as well so it’s about time to have this replaced with something useable. 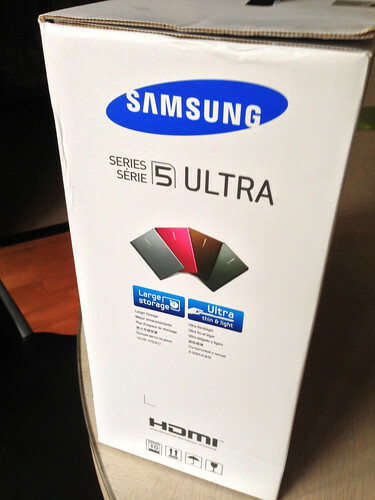 This is a Samsung Series 5 Ultrabook. WEI on this new toy, as expected the graphic performance is holding it back, it’s not for gaming so never mind. It’s actually pretty good for i5-3337 CPU, 8G DDR3 (1600 MHz) RAM, integrated (Intel HD 4000) video card and 500G HDD. This $6,770 toy beats my 2 years old MacBook Pro on all counts running dual core i7 also with 8G RAM (well perhaps not a fair race as Windows 8 is running under Fusion with only 2G 1,333 MHz DDR3 RAM allocated) except on Disk rate. I have briefly browsed all other available brands in shops, SONY is a complete failure, Lenovo isn’t attractive enough for me to touch it, Toshiba isn’t popular amongst retailers Samsung really has their way in terms of promotion and you just can’t miss them when walking by. The build quality of their 9 and 5 series are best amongst other brands, they really are pretty close to Apple for attention to details. I particularly like the feel of the keyboard and the large touchpad although it’s not of glass and not as smooth as Macbook’s. The display is of matte instead of glossy which I like. By the way their touchpad setting window is almost a direct copy of Apple’s. There are still bloatwares, like other brands, but not as much as HP’s. These pre-installed softwares/apps are hidden so visually it’s not that bad (I just hate the HP mini netbook startup screen). OS consideration aside Samsung surely is a better choice for your money. If it’s for work I would pick a model with 256G SSD.